Published on June 25, 2011 by Wade Shepard Follow me on Twitter here. How Much Money do I Need to Travel in Colombia? Colombia is currently expensive for South America, more expensive than Argentina, but less than Brazil, I havent visited Chile so dont know how it compares to that. I spent about 250USD a week, but spent more a couple of times. Hostel dorm bed from 15000-25000 colombian pesos, about 7.50 -12.50 USD a night. Cheap hotel rooms go for 25,000 to 50,000 pesos, $12.50 to $25 per night. Eating, cheap menu del dia, 6000, 3 USD, expensive restaurant 20000-30000, 10-15 USD. A cheap beer from 2000, 1 USD a bottle upwards. A pop or soda in a restaurant, about 1500, 75 cents. Buses are really expensive here, expect to pay around $4 per seat hour. But you can get cheap flights on popular routes with Aires, Copa or Avianca. Last december which is prime holiday time here, a bus from Bogota to the Carribean coast cost 130000, 65 USD which is about 19 hours, a flight can cost the same or less depending on the time and is only 90 mins. In the cities transport is cheap, in Bogota a bus journey is 1400, 70 cents, a transmilienio 1700, 85 cents, and even a taxi is between minimum fare 3300, 1.65 USD, and only 12000, 6 USD for a daytime trip to the airport. As for tourist stuff, last year the Cuidad Perdida trip was 250 USD, and no one I met could get it cheaper. That was the only big tour I did, and everything was included, food sleeping, etc so it was good value really. Visas, I think most European, North American, and Australasian citizens get a free visa on arrival, if you want to extend it, it costs about 75,000, 40 USD, to extend it for a further 30 days. Generally basic items here are cheap, food in a supermarket etc, but more luxuray items are more expensive, often the same price as Europe and North America. 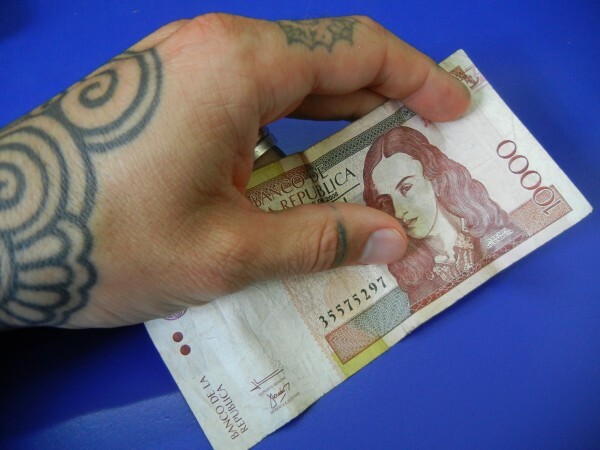 The prime example is going out for a beer, if you go to a cheap area of bogota, no bottle of beer costs more than 3000, 1.50 USD, If you go to Zona T the main upmarket nightlife area of the city, the same beer can cost 8000 or 10000, 4 or 5 USD, and if you want an imported beer, I saw one on a menu for 19000, 9.50 USD. How much money did you spend in Colombia? I just arrived in Colombia, and I can vouch for the prices outlined here. It is the accommodation and transport that really gets you here, the eating can be done rather cheaply. The internal flight option is good to check if planning to make a big jump across the country. Good tips here.